Der Magnus-Lindberg-Zyklus von Ondine gehört zweifelsohne zu den faszinierendsten Produktionen zeitgenössischer Musik. (...) Lindberg schafft es, sich als moderner Komponist unserer Zeit nahtlos in die Reihe Musiker einzufügen, deren Musik (...) in jedem Ton ihre einzigartige Allgemeingültigkeit vermittlen: Bach, Haydn, Mozart, Beethoven, Bruckner, Mahler, Bartok, Shostakovich, Henze, Rihm. Here Lindberg shows a stunning command of orchestration. (...) The best thing I can say about Magnus Lindberg's music (...) is that it is illuminating. (...) Sound and performance are world-class. Lindberg hasn't lost any of his imaginative edge, but the wildest arabesques can still be felt to be part of something that moves (...). The performances are bracingly clean and alert (...) and the recording very convincingly balances clarity and atmosphere. First recordings of lively investigations into orchestral shapes and colours. (...) Sculpture makes this a mandatory purchase for Lindberg's admirers. One of the most intriguing and challenging discs I've heard in a long time. This beautifully played and engineered release is a magnificent addition to Lindberg's growing discography. It should not be missed. (...) For admirers but also for those who have yet to be convinced that contemporary music may be accessible and enjoyable. Here are three recent works that showcase (Magnus Lindberg's) mastery of symphonic argument while also speaking to the imagination (...). Sakari Oramo conducts high-powered performances. These days (Finland's) classical musicians belong to the world's elite. As conducted by Sakari Oramo, the Finnish Radio Symphony Orchestra mixes precision with roaring exuberance. As for Magnus A brilliant disc in all respects: performances, engineering, and above all, the music itself. Lindberg (...), he's a giant among his contemporaries: a composer of uncommon panache, famous for orchestral pieces targeted for big public display, not miniature examination in a laboratory. Three recent harmonically vibrant and sonically adventurous works by the Finnish composer Magnus Lindberg, receive dynamic readings from Sakari Oramo and the Finnish Radio Symphony. This superbly played collection does include his two major orchestral achievements of the first half of the decade (which) are striking examples of Lindberg's recent style. Lindberg is a sort of supercomposer. (...) Here are powerful accounts of three recent works. This terrific disc brings together three of Magnus Lindberg's colourful, large-scale works from the past decade. (...) Sakari Oramo and his superb Finnish orchestra give performances that can only be described as definitive. 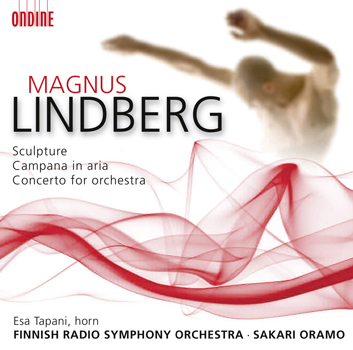 To celebrate Magnus Lindberg's 50th birthday in 2008, this CD features three of the Finnish composer's works from the 10 previous years, including Sculpture, a work inspired by Frank Gehry's new Walt Disney Concert Hall in Los Angeles and Concerto for orchestra. Esa Tapani performs the solo part of the horn concerto Campana in aria. Magnus Lindberg is one of today's most acclaimed composers. Commissions from the world's top orchestras, such as The Philadelphia Orchestra and the Berlin Philharmonic and his many recordings on Ondine and other major labels have helped to position him at the forefront of orchestral composition. Energy, colour and a thrilling density of material are the hallmarks of Lindberg's recent style, and the works on this recording offer entrancing examples thereof. This disc follows on from the great success of the Clarinet Concerto recording, best contemporary / première recording at both the Gramophone Awards and the BBC Music Magazine Awards 2006 (ODE 1038-2). It also featured conductor Sakari Oramo and the Finnish RSO who are recognized experts in the field of their compatriot's music.